Size 26 Tess Holliday leads an army of curvy models at London Fashion Week to promote "body positivity"
Feminism is not a girl’s friend. There is nothing, absolutely nothing, “positive” about being obese. 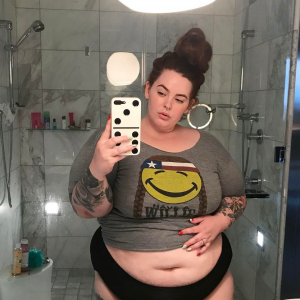 Tess Holliday is 5’5” and weighs 260 pounds, according to bodymeasurements.org. Per the CDC BMI calculator, her BMI is 43.3 – she is obese. Her normal weight range should be 111 to 150 pounds. How in the world did having almost 50 percent body fat become celebrating “body positivity?” Make. It. Stop. From Daily Mail: Women ranging from a size 10 all the up to a 26 have walked the runway to kick off London Fashion Week in what is being hailed as its first ever ‘curve catwalk’. With the average UK size a 16, fashion bosses have regularly come under fire for casting waif-like models to advertise their clothes. But on Thursday evening, seven women of all shapes and sizes took to the stage to showcase their wildly different body shapes in Simply Be’s ‘size inclusive fashion show’ – wearing t-shirts emblazoned with their dress sizes across their chests. Among them were size 26 model Tess Holliday and size 22 Callie Thorpe, both of whom have been outspoken about the plus-size debate in the past. Holliday was this week forced to defend herself after being accused of ‘promoting obesity’ during an appearance on Loose Women. This entry was posted in Culture War, Health Care, Liberals/Democrats/Left, Radical feminists, social justice warriors/SJW and tagged body positivity, London Fashion Week, Obesity. Bookmark the permalink.